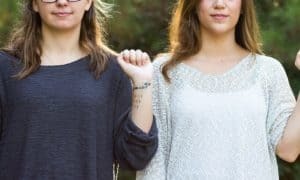 Mother And Daughter Tattoos – Are you and your mother looking for a first-tattoo idea that will celebrate your love and familial bond? Then you should consider these great tattoo ideas. They are classy and stylish designs that will let everyone know what you mean to each other. One of the most popular children’s books of all time is “I Love You Forever.” Why? This book celebrates the beautiful bond between a mother and her children. While the book features a young son, it can be easily adapted to a mother and daughter tattoos. In the book, the phrase “I love you forever, I like you for always, as long you’re living, my baby you’ll be” is repeated insistently. Getting this matching tattoo across your backs can bring you and your mother closer together. Celtic culture is a somewhat mysterious one that often celebrated the power of women and mothers. Getting a pair of Celtic Knots can be a great way to celebrate your unique bond. Choose one that suits the tastes of both you and your mother to get the best result. Try getting them on parts of the body that are easily visible, such as on your lower arm. Putting it here lets the two of you compare and show them off to your friends and family. Shared tattoos like create a wonderful bond that will never break. This idea requires writing poems to each other and getting them tattooed on your body. The poems should highlight aspects that you love about each other. Then, there should be a meaningful image tattooed near the poem, such as your favorite animals. In this way, you can literally showcase your love in a highly personal way. To learn more about classy tattoo designs like this, please don’t hesitate to contact us today.